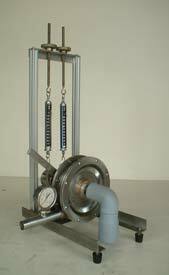 To be used with the Hydraulics Bench, to demonstrate turbine characteristics (torque, power and efficiency) at different conditions. Pressure gauge. Torque is measured by prony brake with spring balance. Flow rate indicated by bench flow meter or measured from measuring tank of the Bench. Speed is indicated on portable non-contact digital tachometer.